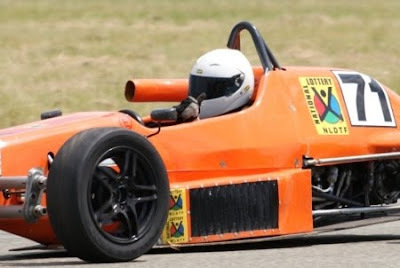 The second round of the national Formula Vee Championship of 2010 was one to remember for Zaahir Essa (Reflex Solutions), which took place at Midvaal with the Execuline Historic Tour this weekend. Essa, a development entry in the category, opened his account for 2010 with his first pole position and double victory, driving a Lotto-provided car after using an older model for the last three years. The two wins did not come easily however, with ex-champions Peter Hills (MLS Consulting) and Symm Grobler (Auto Mecca) also competing hard for victory throughout the 12-lap races. Both heats proved to be close encounters, with Zaahir managing to lead the majority of laps, staying ahead and out of trouble on the bumpy circuit of Midvaal. This strong showing for Essa has resulted in him jumping to fourth in the championship, after missing the first round at East London due to financial setbacks. The third round of the Formula Vee championship takes place at Zwartkops on the 10th April.